First of all, I would like to apologize in advance if my question is foolish, I'm a newcomer to CI and all this stuff. I used this manual and managed to create appveyor.yml which satisfying first two conditions - link to github file. 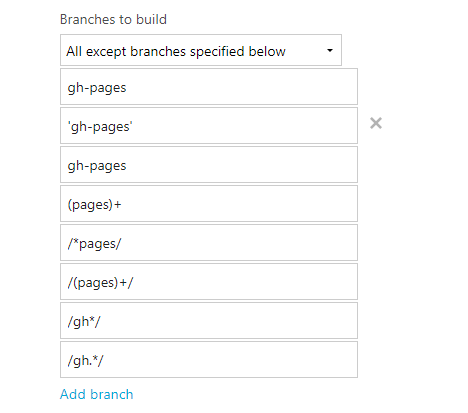 Unfortunately, the third condition is unfulfilled - gh-pages branch still building - this build for instance. I have found this line: gh-pages branch is always excluded unless explicitly added in “only” list. in doc and check one more time that I don't have this branch in "only" list. but the branch still builds. No need to apologize, this part is really complicated :) gh-pages excluded if you have branch filtering. But in your configuration there are multiple configuration, and not branch filtering. UI settings from screenshot does not apply as YAML takes over UI. Please try this YAML. It has default config for all branches, special one for master and gh-pages are filtered out.